Thanksgiving may be over, but you’re probably staring down a refrigerator full of leftovers. Turkey for the rest of the week may not sound appetizing, but at least we can give thanks for all the great Genesis games we got to play this month! Our staff and readers put down their turkey legs and share what they’ve been playing all month. I love R-Type on the Master System. I love the sound, even without the FM enhancement, and I love the graphics. It’s a wonderful port, despite the flicker, and despite how hard it is. Maybe it’s just me, but I found the game to be brutally difficult back then. I remember trying to beat it way back in the day with my friends. One sat near the console and repeatedly pressed the pause button, creating a really low-tech slow-motion effect. That is, until he hit the button too hard and the console locked up ON THE LAST STAGE. I threw my controller at him in frustration and vowed never to play R-Type again. Fast forward 25 years, and I’ve finally acquired a complete copy of the game. I’ve decided to enjoy R-Type for what it is and not play for completion’s sake. With that perspective, I’ve found new love for the game that I haven’t felt in a long time. It’s truly a wonderful port, and I’m so very glad to have it in my Master System library once again. I never get the time to enjoy as much game playing time as I used to. I had to work seven days straight, including Thanksgiving day, and a friend and I are trying to start up a traveling video game store which is eating up lots of my spare time. It’s also harder to get into games than it used to be for me now, so it was nice to finally sit down with an engrossing game and be able to unwind and really enjoy myself. I used to own another copy of Golden Axe Warrior many years ago that a friend of mine gave me for free, but it turned up missing quite a while ago. I decided to fork out the money and buy another copy this time, and I went for a complete in box copy. I finally decided to play it again and finish it this time, since I only got through about half of it last time. Once I started playing, I decided to use a walkthrough just because I knew that I wouldn’t have the time to find my way around this game without one. The more I started playing it, the more I enjoyed it despite it being a blatant ripoff of The Legend Of Zelda. I think it’s a little more difficult than Zelda and some areas are a bit unbalanced in difficulty, but otherwise it’s a really great game in its own right. I don’t like a lot of the American library for the Sega Master System, but this game drew me in. I finished it within a week or so of starting it and was able to relax over the holiday while playing it. I am also extra happy to have another copy of this game, as I re-completed my US Sega Master System collection which is a great feeling for me! If there’s any time I’m likely to crack open a Koei game, it’s during the holidays. Except for those unlucky folks who work in retail, most of us get at least a few days’ respite from our busy schedules. Family, travel, and turkey may eat up some of that free time, but if we’re lucky, we can carve out (pun intended) a couple big blocks to tackle one or two of those projects we’ve been meaning to do “someday”. For me, Koei’s intricate strategy titles are high on my “someday” list, and there’s certainly no doubt they take up huge chunks of time. 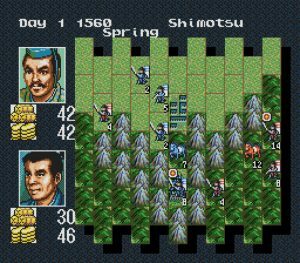 Earlier this year, my career had me living far from home and family for several months, and during my downtime I ended up beating the Game Boy port of Nobunaga’s Ambition. 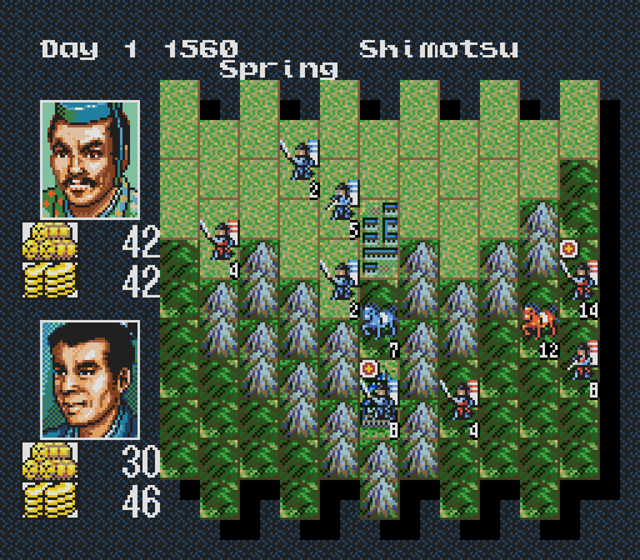 Now, back home in November for a quiet Thanksgiving with my wife, I decided to fire up the Genesis version of Nobunaga while she puttered away in the kitchen (don’t worry, I did the dishes). I always expect Koei games to have a tough learning curve, but the time I spent with the portable version made my transition into the Genesis game pretty easy. I opted to play the first scenario, Battle for the East, which only makes you deal with 17 fiefs vs. the 50 fiefs of the other three scenarios. Unlike many other Koei games – in which completing a more modest, smaller-scale scenario just catapults you into a “Now conquer the world!” mode – winning the Battle for the East gives you a proper ending sequence, which makes Nobunaga’s Ambition a good choice for a (relatively) quick Koei fix. I only played on difficulty level one of five, so I didn’t have too much trouble slowly crushing the opposing daimyos with my massed armies of cavalry and riflemen. One of my favorite things in any Koei game is that moment when you’ve consolidated your territory enough so that you only have one or two frontiers with the enemy, and can strike out with all your forces without leaving an empty territory vulnerable to counterattack in their wake. Once that happened in my playthrough, I knew victory was at hand and indeed, I finished just in time for dinner, which I enjoyed with the warm glow of a conqueror’s satisfaction. Many people carved a turkey or a roast this year on Thanksgiving, but how many can say they unified Japan? Played a few Genesis games this month, namely more cartoon platformers, but this is the only one I finished and haven’t yet talked about on the forums. So how did it go? Well, the first attempt with Coyote actually failed to my surprise. Because I remembered renting this game as a kid, beating it right away, and returning it for a game that could keep me busy the entire away from school weekend. On my second attempt I beat it no problem, but I finally was able to play as the Road Runner next, something I didn’t know could be done as a kid in my haste to exchange said rental. Playing as Road Runner is harder due to increased speeds that results in harder to control physics and that you frequently have to dodge the Coyote too. Still beat it on first attempt, and that was that… or was it? Just before submitting this I decided to get some more out of this game and go for the 1cc. Got it first attempt with Coyote, and two failed attempts + four stage one soft resets with Road Runner. I’m happy I gave this game more of a chance these days, as I’m not as disappointed this time around. Graphics always pleased me and the game does a great job capturing the spirit of the cartoon, but something still feels rushed or not as well realized. This month, I spent a few days playing through both Last Battle and its blood-filled Japanese Mega Drive counterpart. Most folks can’t stand this game, but I’ve always had a soft spot for it ever since I first played it back in the early 1990s. Now, it’s time for some reminiscing. An acquaintance of mine, who was a few years older, said he would let me borrow his copy of the game, provided I could make it over to his house which was on the other side of town. It took some convincing and pleading before my mother agreed to drive me over there. This was during the winter, and her disposition didn’t improve when we started encountering some major patches of ice along the road which hindered our progress and led to a conversation about going out in weather like this for a mere video game. We did make it there, and after spending a few minutes watching this acquaintance of mine play Burning Force, I left with Last Battle in hand and we returned home without incident. There’s another story here involving this same person and Phantasy Star which I’ll save for next month’s Reader Roundtable. The most irksome feature of Last Battle has always been the ease of which you can screw up by taking the wrong routes on the map and being forced to start all the way back at the beginning after one of the bosses has soundly duffed you up. Thankfully, I had found the continue code from an issue of EGM or Sega Visions and could make some progress in the game. After about a week or two, I finally completed it and then returned it to its owner and never borrowed another game from this person again. Playing the game again this month reminded me of both these episodes, and they seemed like a good idea for the Roundtable because, after all, what else can you really say about Last Battle that hasn’t already been said? For whatever reason, I’ve become fascinated by the Sega Master System. Born just a tad too late to experience the 8-bit era firsthand, it wasn’t until I started revisiting the Genesis’ library a several years ago that I learned that Sega had made consoles other than the Genesis and Dreamcast (that’s right, I recently learned that the Sega Saturn existed). About a month ago I decided on a whim to get a Power Base Converter and have been steadily picking up a small handful of games to go with it. As the title of this Reader Roundtable entry suggests, the game that held my attention most was the original Phantasy Star. What a game! I’ve mentioned before, that I’m not a huge fan of RPGs, mostly because I’m not big on the whole story-driven aspect; however, I appreciate that the story of Phantasy Star is compelling enough to interest me, and yet simple enough to make me want to see it through to its completion. For those who don’t know, you play as Alis Landale, whose brother Nero was killed by the evil Lassic and now she’s out to get revenge. That’s it! It’s such a selfish reason to take down an evil force — it’s not like she’s interested in stopping Lassic because he poses a legitimate threat to the Algol system (presumably her brother’s motive) — and I love it. But, what I really enjoyed more than that were the numerous dungeons Alis and her comrades had to trek through. These are done in the first-person, and enemies pop up out of nowhere, sometimes startling me. Most of the dungeons are extremely maze-like, sometimes sending Alis up and down several floors before reaching the exit, and I enjoyed making my own maps as I navigated each maze. Oh, and being able to save at any time (except during battle) was extremely helpful as well, especially toward the end of the game. In the end, Alis and her teammates confronted the final boss and it was a difficult battle, even with all the best weapons/armor. Alis’ party members died one by one, and just as Alis was about to be defeated herself she miraculously dealt the final blow, ridding the Algol system of evil at last. The victory, however, was rather hollow; she had no one to share it with, after all, since the friends she made during her quest were killed during that final fight. That wasn’t the actual ending of the game, mind you, just my take on the events of my playthrough. The real cut scene that took place was a bit jarring to me, because it seemed to come out of left field. Overall though, I had a great time playing this one! This is one of the craziest hacks I’ve seen, and it combines two of my favorite series! The latest version came out just a couple months ago, September 2016, from an individual known as “Candra Software.” 23 playable characters(!) include Sonic and Shadow, Miku, Adam (from the first Streets of Rage), plus all the enemies, including those from the Sonic universe, like Eggman and his robots! I had never heard of Miku before, but she’s a well-drawn and well-animated chibi anime character, and I assume she was taken from some game that I’m not familiar with. I also found out she’s a popular character in Japan, originating from music software programs, where she sings with a synthesizer voice. In addition to also appearing in video games and anime, she has even “performed” at live concerts, as an animated projection! All of this explains her special attack here, singing out musical notes that smash into enemies! The characters from the Sonic universe all have large pixels that might suggest they came from a game with a small screen display, one of those modern portable games that I’ve never played. The larger pixels also make them stand out from everything else, like cartoon characters thrown into a realistic world. It’s like a brawler version of that movie Who Framed Roger Rabbit?, so it’s very wild and fun. Sonic looks great, and he’s well-animated as he punches, kicks, and jump-kicks his way through the mean streets. It’s kind of amazing to see Sonic stabbing enemies with knives, and hitting them with pipes! Likewise, it’s insane to see Eggman’s robots wielding knives and weapons. Ironically, Sonic isn’t very fast, and I wish he could run around faster (like Skate). But he does at least have a couple attacks that use his trademark spinning, and he’s very fun to control. I’d say this hack is a must-play for any fans of Sonic and Streets of Rage 2. Click here to check it out, on ROMhacking.net! Bare Knuckle III/Streets of Rage 3 By Joseph C.
I finally got an EverDrive this month; having wanted one for quite some time. After some difficulty experimenting with SD cards, I finally got it working and began looking through titles. I didn’t really spend much time on any one as I was more interested in seeing what worked and what didn’t. Once I got to the Japanese version of Streets of Rage 3 though, I found myself wanting to give it more of a run. This was the first time I’d ever played it. Streets of Rage 3 has long had an allure because it has always been a game just out of reach for me. When the game was new, I didn’t own it nor did any of my friends, which meant I could only rent it. I can’t even remember ever seeing it for sale. Today it is always in high demand and this is certainly true of the superior Japanese version and the price is only getting further and further beyond what I’m willing to pay. I won’t go over the well-known differences with the difficulty, characters and story but only repeat that this is indeed the version to play. Streets of Rage 2 remains the best in the series (and arguably genre), but there is still a lot to like about Streets of Rage 3. The variety in the gameplay, the expanded story and improved character roster are the main improvements. I also loved the way the story could change depending on certain conditions. On a particularly negative side, I have never understood what Yuzo Koshiro was thinking when he composed the music for this game. From the character select screen onward, many of the compositions grate on me, and I can’t be alone in thinking this. If the Japanese version had been localized as it was and the soundtrack had been at least on par with the last two, I imagine this would be my favourite in the series. As it is, it’s the last of a great series and I’m not holding out for a new entry at all, let alone one that would do the series justice.